Use this unique skull to study internal structure that other are visible only through x-ray images. This model is made of hard unbreakable plastic. 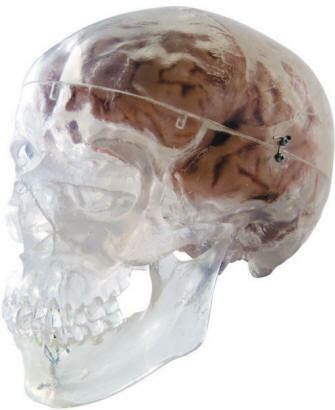 It provides highly accurate representation of the fissures, foramina, processes, sutures, etc. It can be disassembled into skull cap, base of skull and mandible. 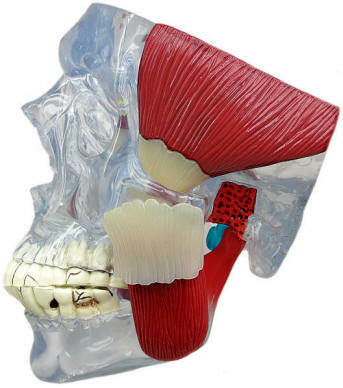 Temporomandibular Joint Model, demonstrating the problematic conditions associated with the joint capsule. Emphasis on the disc, surrounding bone inflammation, and also the affects on the teeth, (cracks, chips, cavities, and characteristics of bruxism). Model Size: 6" x 6" x 6-1/2"